George Harrison spent the last years of his life in Los Angeles. 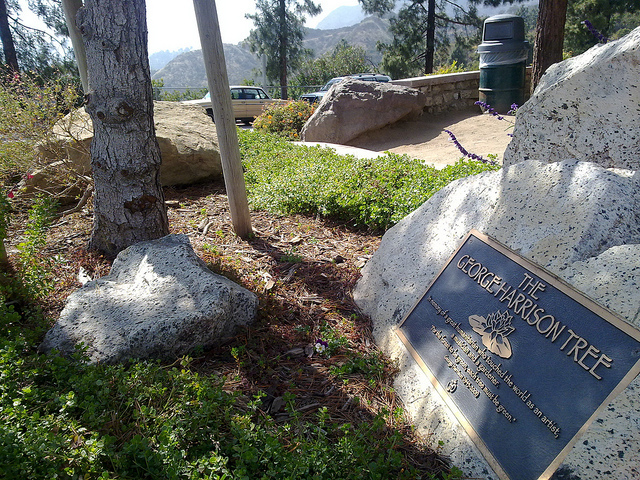 In 2004, three years after his passing, a memorial pine tree was planted in his memory in Griffith Park. Harrison, an avid gardener, would probably have enjoyed the irony – the tree was destroyed by beetles. Harrison once said his biggest break was getting into the Beatles, and his second biggest break was getting out. This entry was posted in Music and tagged 2014, All things must pass, George Harrison tree, Music, postaweek2014. Bookmark the permalink. Thank you for this post. It brings back good memories and brings thoughts of peace. It does for me too. For me, George represents a life beautifully lived, and I still enjoy the music he left us. George was always my favorite of the Beatles. Thanks for the memories. Mine too, and especially after he went his own way.